joy magnetism: "If it ain't Boeing, I ain't going"
I love tours. I've said it before, I'd take a tour of a paper bag and the factory that made it, if there were one available. So when I was in Seattle late last year, I totally went to the Boeing plant in Everett, after hearing what a great tour they had. And, dudes. They totally had the best tour ever! It comes in a close second to the VIP WB Tour, my favorite tour ever. Part of this enthusiasm I know is because of the work I did with Brazil's Embraer years ago - and I loved seeing the concept work, the factory shots, the brochureware that we did. Seeing a plane go from a drawing to a fully flight-tested piece of machinery that flies? In the air? With people? That's pretty freakin' cool. So, yeah. All over this tour. On the drive in, you kinda freak out when you pass by the largest building in the world, with apparently the largest digital graphic sign in the world. It's the Boeing factory, where they build the 747, 767, 777 and the 787 Dreamliner. 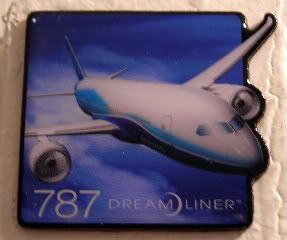 The 787's supposed to fly more people for less fuel and energy and time, and uses soooo many different parts from so many different places, the darn thing has its own plane! They've had to retrofit the 747-400 into a cargo plane called the Dreamlifter. It's sooo fat and cute, I love it! It was actually my favorite plane there. The tour actually starts at the Future of Flight building, where they make you check all your electronics. Dudes. My blackberry and my cell. Talk about trauma. I was a little freaked out over not having either on my person. For two hours. Heh. But, the corporate video was pretty good - you have to love a good corporate video. If they're good, they make you tear up, and go, dang, what a great company! Then again, a lot of their corporate ads do much the same for me anyway. Then, they pile you all into a motor coach, and you get driven out to the giant factory - where you get to enter from the basement...which was supercool. It's like miles and miles of corridor, I would bet money any action flick would so want to use for a location shoot. The coolest thing ever. You can totally pretend that you're in that action flick. As I was. In my head, of course. Saving the world from evul. Right from the bowels of the Boeing factory. They take you up to the factory, and you get to walk around on a bird's nest type level, where you're above all the action, but totally seeing it all. How they're riveting the planes together, how they're putting components together, how they're painting. From start to finish. And it's not just one plane, it's like several. At one time. Turn here, and here's where the nose is being attached. Turn here, and here's where the tail section's being attached. Turn here, and the wings are getting ready to be riveted on. That's just how big the building it - several, several football fields big! It's amazing! They apparently have 1,300 bikes to help the factory's 30,000 employees get around. After a quick trip around the tarmac, the tour ends with a ride back to the admin building, and of course, a trip to the gift shop - seriously, I could have walked out with like a dozen magnets. Restraint, people, that's also what I learned there. Plus, they hand you a superfun, and of course, well-designed DVD piece filled with fact sheets. What? It's part of what I do for a living, look at what other people's branding! Mind you, it's not like I'm running out to buy a plane, but still - fun! But, no best tour ever would be the best tour ever without the best tour guide ever. And that's what we had. The best tour guide ever. No, seriously. He knew his stuff, he was a former Boeing designer, a former serviceman, and it helped that he was a funny, funny guy. The fun part for me, is that he was also a Big Band guy. No, like he plays in a Big Band combo. He's a little young for that generation - like my dad, he was born a bit after his time. But you know that sax part in Peggy Lee's Rockin' Around the Christmas Tree? Totally him, when he was like 16! It was Christmastime, and I literally had just heard that song on the way in. He was tickled. As was I. But, then, he went on about how he knew a few people from the actual Glenn Miller Orchestra. I love Glenn Miller! Because I'm secretly a 90-year-old chick in a mid-30s body! But whatever! The dude even had a couple of Glenn Miller orchestrations - one of which was American Patrol, the song my dad hummed to us growing up. So, yes, in the middle of the Boeing plant in Everett, WA, I held up my hands and did the hand dance my dad always made us do, as I hummed along with the tour guide. What? Like I said, best. tour. ever.